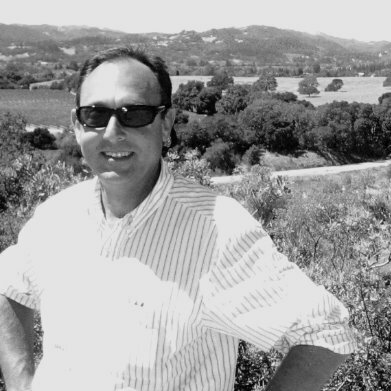 On a gorgeous Sonoma evening, Dysfunctional Family Winery made its official and exceptionally grand public debut. The town mayor sang the star bangled banner (no, she did not). The Wine Spectator immediately awarded 100-points and declared it the ‘wine of the century’ (never gonna happen). And the Blue Angels did a super-sonic fly over (somewhere, but not here). Assisted by our rare and precious vineyard dog, Mr. Ploofy, (actually, we don’t have a dog) and our spectacularly gorgeous family (too ‘busy’ to attend), we proudly introduced our multi-generational (um, no) and outrageously expensive cult wine (hardly) to an adoring crowd (well, yeah, maybe). 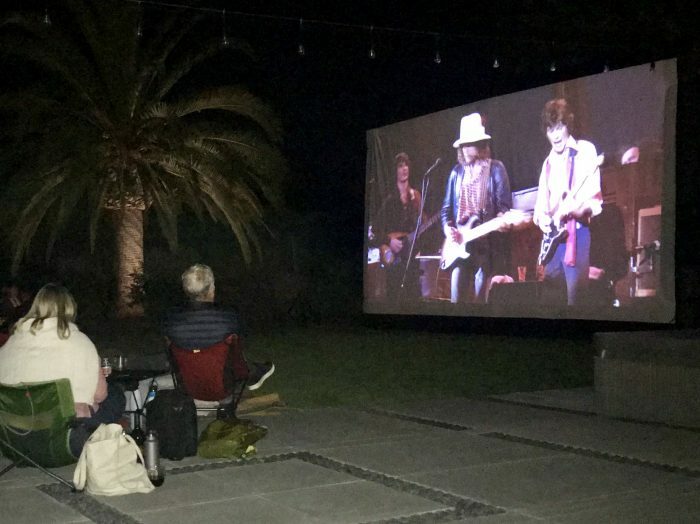 The occasion was the outdoor nighttime screening at Hydeout Sonoma of Martin Scorsese’s “The Last Waltz” (The Band, 1976). 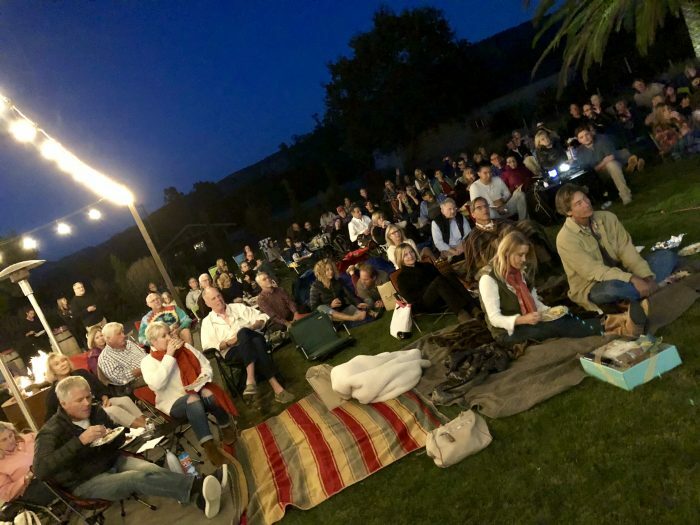 The event was presented by the Sonoma International Film Festival to a large crowd that spilled out over the lawn with chairs, blankets, and jackets. Everyone sang along (for real) with Bob Dylan, Robbie Robertson, Levon Helm, Neil Young, Emmylou Harris, Eric Clapton, and many others. 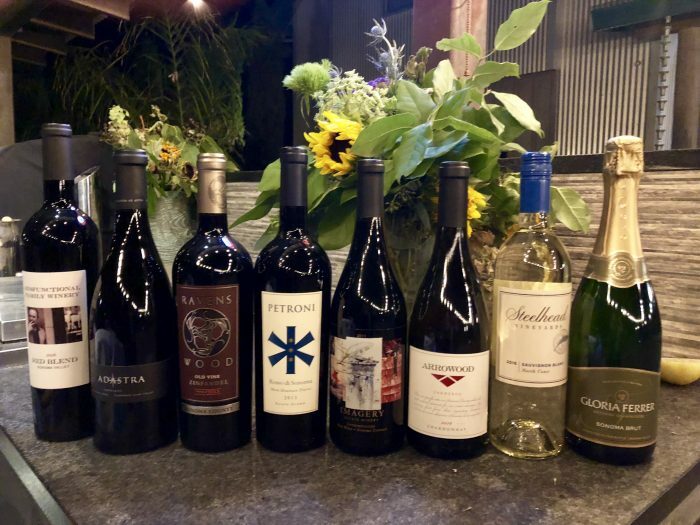 And everyone enjoyed many superb and well known wines from around Sonoma, each of whom generously support the film festival. 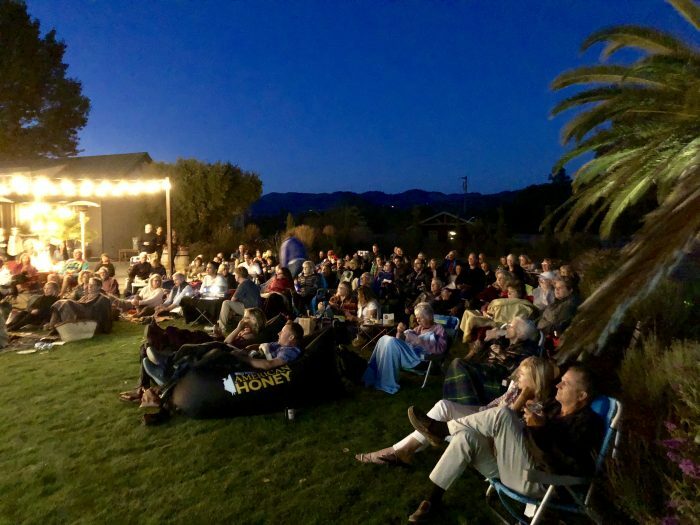 Executive Director of the film festival, Kevin McNeely, welcomed everyone, thanked the volunteers and hosts, chatted up the debut of the Dysfunctional Family Winery 2016 Red Blend, and introduced the film screening. 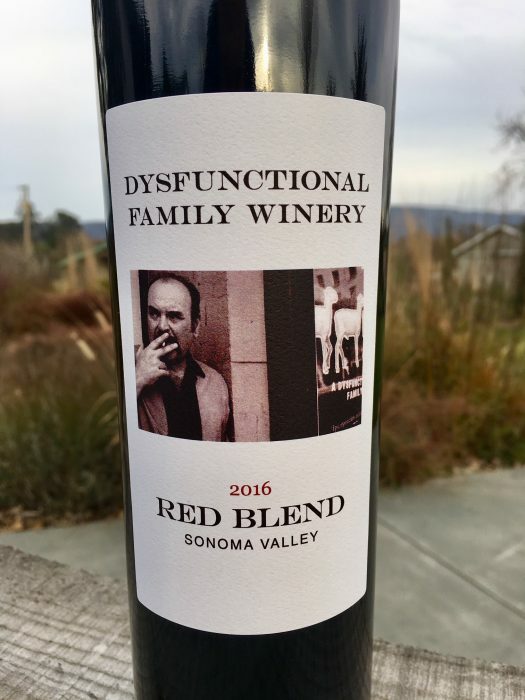 By the end of the evening, the night’s supply of Dysfunctional Family Winery 2016 Red Blend was exhausted. 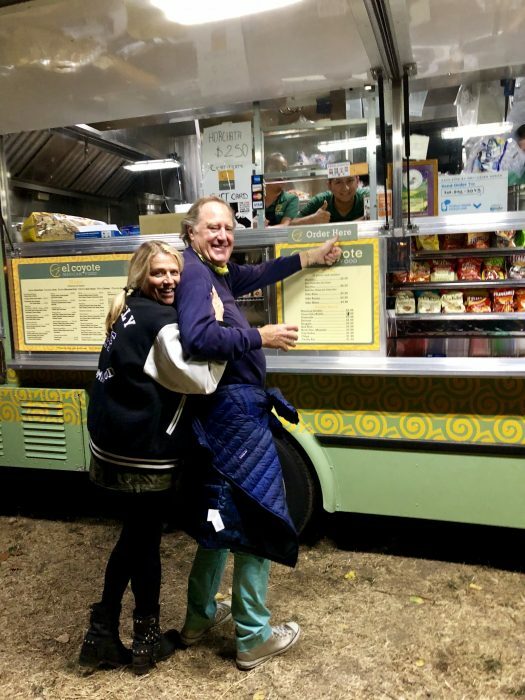 During the evening, wine and movie lovers enjoyed food from the well-known Sonoma food truck institution, El Coyote. 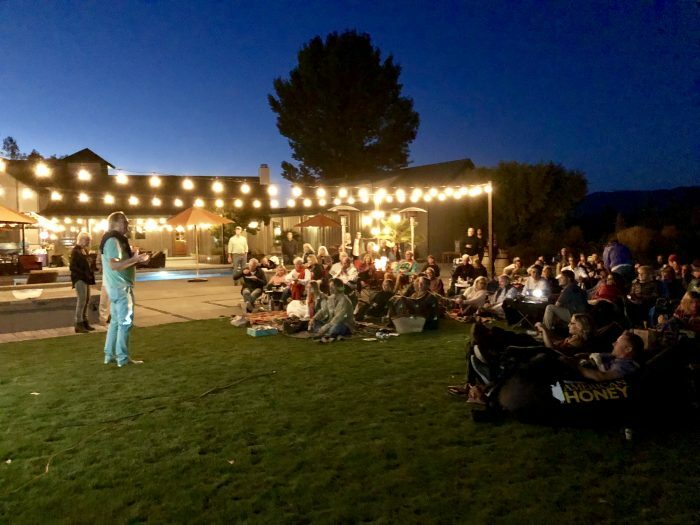 During a brief pause in the film, everyone dug into their tacos and burritos, and when the movie re-started, hoots and hollers were heard echoing across the lawn. Another good time at the Hydeout. And a welcome start for the Dysfunctional Family Winery. 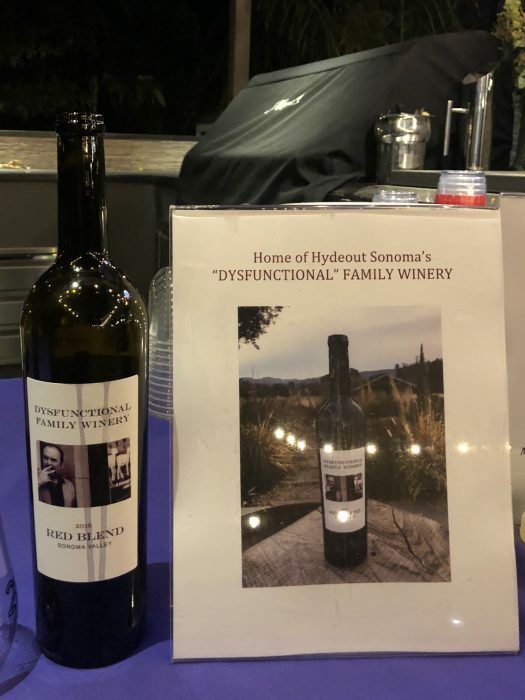 About the wine: Dysfunctional Family Winery’s 2016 “Red Blend” – Made of equal parts Cabernet Sauvignon (from Sonoma Mountain), Sangiovese (from Moon Mountain), Zinfandel (from Bennett Valley), and Merlot (from Carneros), the grapes were de-stemmed (but not crushed) and the whole berries were frozen-Nitrogen cold-soaked for three days, then fermentation was allowed to proceeded rapidly for 2 weeks, then the wine was pressed off fairly hard, and barreled up in a 50/50 mix of once-used French and American oak for 20 months; the wine is dark and inky, with a plush texture and evident fruit, but with soft tannins, and is meant to drink now. $25/bottle. About the label: The photograph is an original shot by Dennis Wornick, then an 8th grader, using a Kodak “FunSaver” instamatic camera, and who took the train by himself from Burlingame into San Francisco, walked to the Tenderloin neighborhood, and obtained an image of this creepy cigarette-smoking fellow standing in front of ‘a dysfunctional family’ window display. 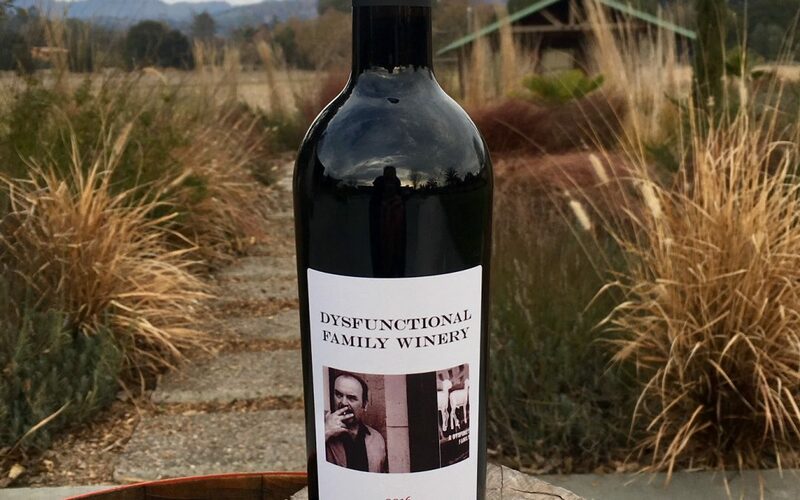 Please read closely: Dysfunctional Family wines are only available to the public at an off-site tasting room location (per Federal, State, Local, Deep State, State Department, and Bureau of Intensive Governent Meddling in Citizens Private Affairs laws, regulations, and don’t jump into the bathtub with an electrified toaster consumer protection statutes). 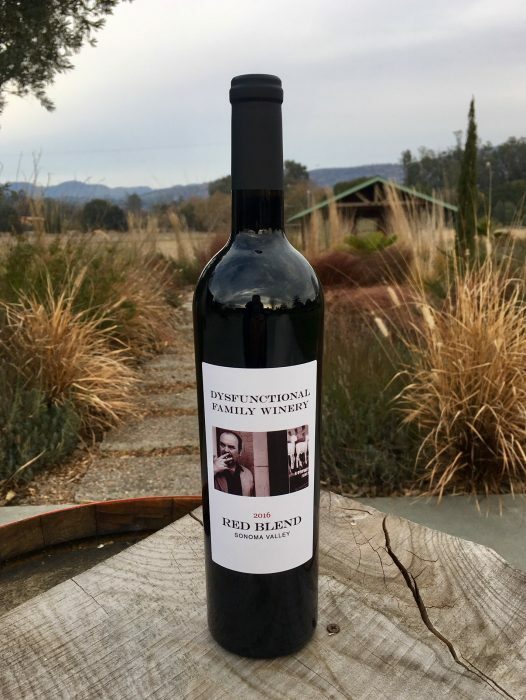 We hope someday that this wine will be available for sale at the Hydeout (pending a permit currently under consideration at the Sonoma County Permit and Resource Management Department). Seriously funny. Great event. Terrific hosts too. Very funny. Nice work. I am also dysfunctional. Does this constitute an infringement of our patents. Keep me on the list, can’t wait. All are welcome into the Dysfunctional Family. Thanks for the support. Love your writing, I want to give you a hug, great way to start my morning! I accept the electronic hug, and send one right back at you! Congrats Ken! Can’t wait to try some of that wine! Ben, ti will be here waiting for you! So funny! The event sounded great. Runners can be dysfunctional too (in a good way) so we look forward to trying some of your wine, post run! Deb and I can’t wait to be a part of your dysfunctional wine family. The blend sounds very interesting-can’t wait to give it swirl and taste! Hi Ken. Looks like a good time. Wish we were there. Great night, great hosts, great venue, great movie, great wine, great fun. Congratulations Amigo! We have to get down to see you. Nicely done Ken, looks like another great time at the Hydeout. Love to you and Cynthia.